If you don’t have a car, getting to Dersu wouldn’t be very simple. There are no direct buses going there, and Dalnekutsky Airport has become a beautiful legend long time ago. But the more difficult to get to the destination, the more interesting it is. Our journey has been very extreme. At 20:30 we boarded the bus Vladivostok – Vostretsovo and started cursing everything straight for 11 hours – the bus, the terrible roads and the whole idea to use this type of transport, rather than, say, a train. At night, sleeping while sitting on uncomfortable seats is not difficult, it is simply impossible. And you can’t look out the window – it’s dark, and you can’t see anything. The only option left is to turn from side to side, dreaming of the next stop, no matter where, just to get out and get some fresh air. So, at 7:30 am the bus stopped at the store which is also a ticket office in the village Roshchino – our final stop. Heavy rain, that greeted caused us to worry about the future path. Ticket offece of the village Roshchino settled in a corner of a large store. A woman sat behind a table writing something in a big notebook. – Tell me please, how do we get to Dersu? – No way, only a taxi! – Buses do not go there? – I told you, only a taxi. Buses have long ceased to go there. In order to shoot in Dersu, it was necessary to first ask permission from the head of the community. The Old Believers are a little secretive people, not very open to journalists. As it turned out their dislike for our brothers journalists have occurred after all of their visits and promises to help, but as time has shown – no help had come. – Hello, hello! Is that Fedor Savelich? – Who’s talking to me? – The voice on the phone stressed the letter “O”. – You are bothered by the Primamedia. 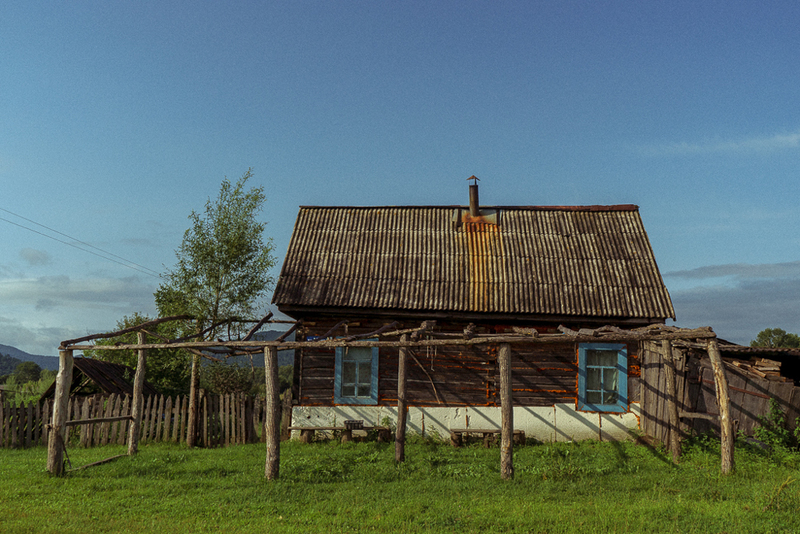 We would like to make a report about the life of the Old Believers in Dersu. Tell about your way of life, traditions and problems. We would like to ask for the permission to shoot. – I am not Fedor Savelich, I am Ephraim. Fedor Sevelich is my grandfather. – Is it possible to invite him to the phone when he’s around? – Yes, when should I call? Later when we called, we got the address where Fedor Savelich was waiting for us. If you meet a bear, don’t run away from it. For a small amount of money a local taxi driver took us to a little one-storey house. At the gate we were greeted by Ephraim – a tall, stout man with a red beard. He appeared to be about 30. Ephraim was dressed in a green belted shirt. Having approached the gate, he pulled it a little, closing it tighter. After introducing ourselves again, we talked about our plans and desire to photograph people. – I’m going to ask my granddad – Ephraim said after a brief pause, and disappeared in the house. From a small window of the veranda, where Ephraim went, pulling the curtain a little, a young man was looking at us. Having noticed that we were looking at him, he quickly shut the curtain. – My granddad is against this. Maybe if you talk to him yourself, he’ll agree? – Ephraim said, and not waiting for our answer, went into the house again. We were still standing on the other side of the gate thinking that our trip was about to fail. That we’ll be banned from shooting in the village and the whole trip would be just a waste of time and money. A few minutes later the head of the community Fedor Savelyevich came to us with Ephraim trotting behind him. A short, wiry, with narrowed eyes, the head of the community slowly walked to the gate. – So what is it that you want? – Fedor immediately blurted out. We told our plans once again, and hinted that the pictures of people are absolutely necessary. The report would not be complete, and the colleagues would not understand us. We also asked him to tell us about the problems of the village. – And what problems are you talking about? – What do you mean – what problems?! Condition of roads, land boundaries, and everything that you’ll tell. – Well go, since you’ve already here. Whatever. But you can not take pictures! It’s a sin! – Pictures of people? And what about the houses? – Houses – alright. All except humans. – Well, thank you for this, at least! – Find Julian there. Say you’re from me. He’ll show you everything and tell stories, if needed. – And how will you get there? – We do not know yet. Probably a taxi. Well, or on foot. We’ll see. 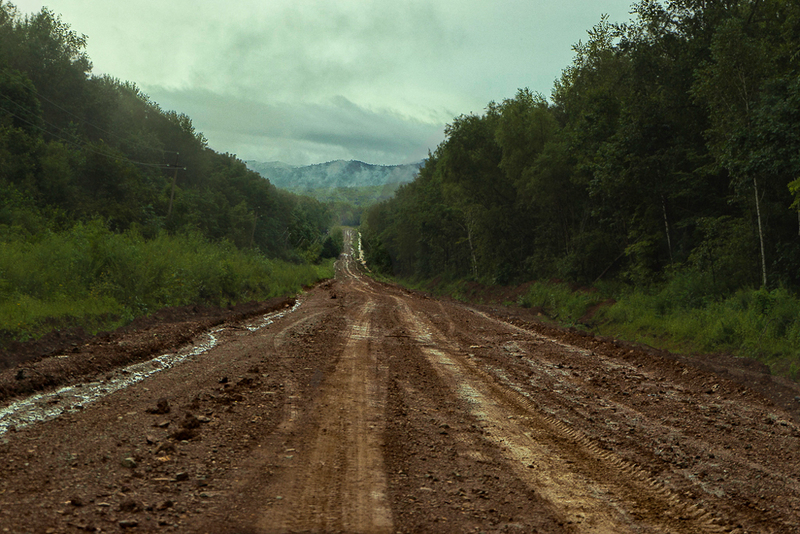 The distance from Roshchino to Dersu is about 60 kilometers on a dirt road. This way you can get to Plastun and Terney. But that road goes to the right side, and the one for Dersu, Kut and Ostrovnoe – to the left. The taxi fare was 1600 rubles one way. White “Toyota Probox” took us along the wide dirt road. On the left there was the Big Ussurka river, on the right – dense forest. In some places the sections of road were flooded. After about 15 km the taxi driver stopped in front of a big puddle, which turned the road into a small lake. Is it deep or not – no one knew. I had to get out of the car, roll my jeans and measure the depth. After 20 meters the water was already knee-deep. I turned around, and saw that the taxi driver waves at me, saying to go back. – No man, I will not pass here. Either go back or go on foot. – Is it a long way to go? – Of course Long. About 45 kilometers left. – So, a lot of water? I do not know how, but the crew of this low “Skyline” was able to overcome this obstacle. We decided that if we call a taxi, we want the driver to be already drunk. So we went on for about half an hour, when an old man on an old car agreed to give us a ride. It turned out he was going to Melnichnoe, so he took us up to the fork in the road where everyone said goodbye and walked their way. He accepted no money from us. We caught our next ride in about 40 minutes. The couple was traveling to Dalniy Kut and gladly agreed to drive us to the ferry. They also didn’t want any money. 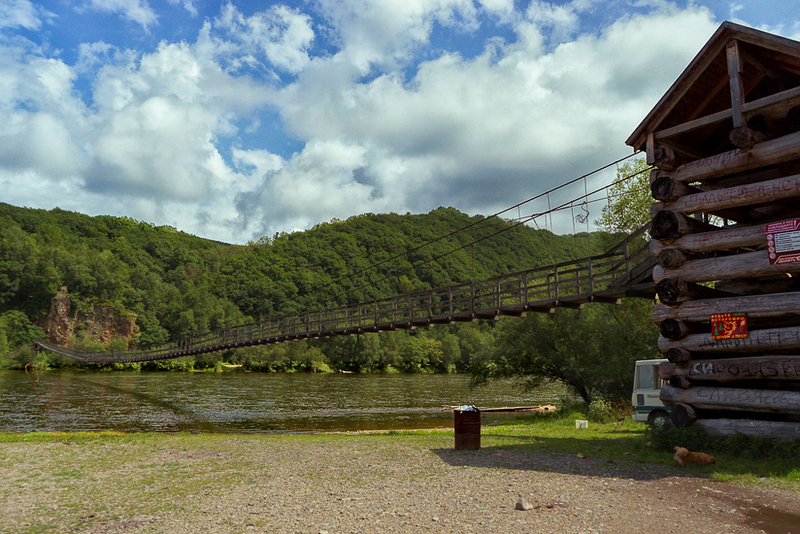 The ferry is a wooden turret with a suspension bridge for pedestrians stretching from it. Vehicles and other equipment are transported by the so-called barge. In fact, that piece of metal barely can be called barge. It’s just a part of the pontoon bridge, which is moved by a steel cable stretched between the banks and by the river flow. Once you turn the barge by a certain angle, it immediately moves to the other side. Getting from one side to another takes about 5 minutes. Barge runs at a certain time. At the appointed time the man working on a barge comes and transports people from one bank to another. We went on a suspension bridge, which is swinging from side to side when you walk on it. 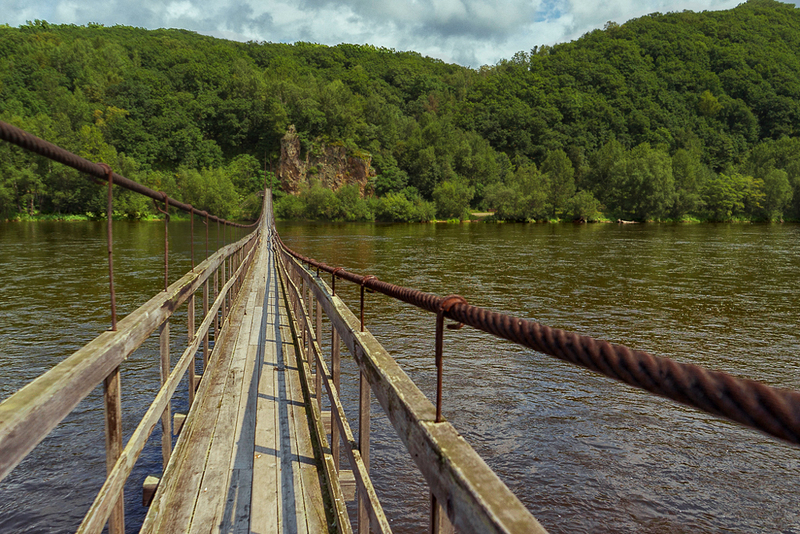 Big Ussurka river flows under the bridge. Before we go to Dersu, we need to meet the head of Dalniy Kut settlement Anna Leonova. In addition to material on the Dersu, we need to work in Dalniy Kut and Ostrovnoy settlements, which is rumored to be inhabited by only one person. From the ferry to the Dalniy Kut is only about 2 kilometers, it took us no more than half an hour. After finding the head of the settlement and agreed that we will soon visit their village and we asked to help us with a shuttle to the Dersu. 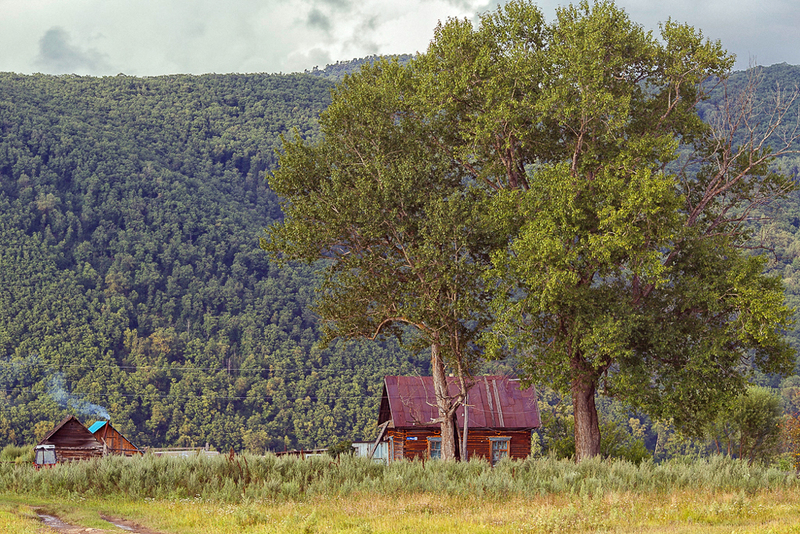 Anna Leonova advised us to find someone local, who agreed to take us to Dersu. After a walk through the village we started trying to find a local transport to Dersu. A guy, who volunteered to take us, comes to Dalniy Kut just to relax from hectic city life, and simply to talk with his friends. An old three-door “Mitsubishi Mini” looked little like a car, which was able to get us anywhere. If you saw this vehicle parked somewhere on the road, you would have thought that was an abandoned car. However, it was purchased specifically for these roads. The path that we took to Dersu hardly can be called a road, barely even a direction. It felt like we were going on a bed of once rapid river – just stones and rocks everywhere. Rumbling, our mini-SUV snail’s speeded its way through that road. Occasionally, the so-called bridges which collapsed after the rain came across. In order to go through, we had to move the boards according to the dimensions of the car. – May we stop sometimes? I want to take photos of the road. – Yes, we’re writing about Dersu and Dalniy Kut. – It’s good! Of course, you can take pictures. Only such cars can pass here. I don’t feel particularly sorry for it. I bought it especially for this kind of trips. 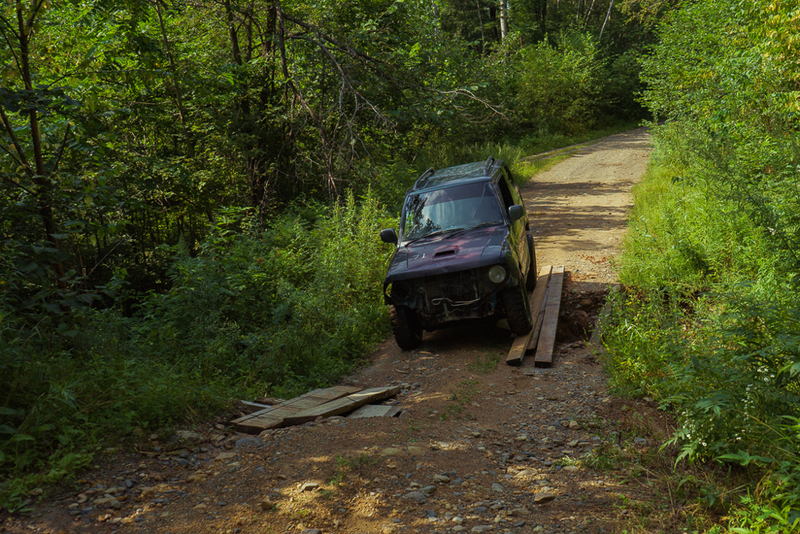 We stopped from time to time to capture the state of the road and to move the boards on numerous bridges. Some 5 km took us almost an hour. The trip cost 1,000 rubles.